The data in this series supports research for a paper being prepared for journal submission and peer review. More details will be provided upon acceptance of the manuscript. Reference: (Peiffer et al., 2008). Pfeiffer BD, Jenett A, Hammonds AS, Ngo TT, Misra S, Murphy C, et al. Tools for neuroanatomy and neurogenetics in Drosophila. Proc Natl Acad Sci U S A. 2008;105(28):9715-20. doi: 10.1073/pnas.0803697105. PubMed PMID: 18621688; PubMed Central PMCID: PMCPMC2447866. 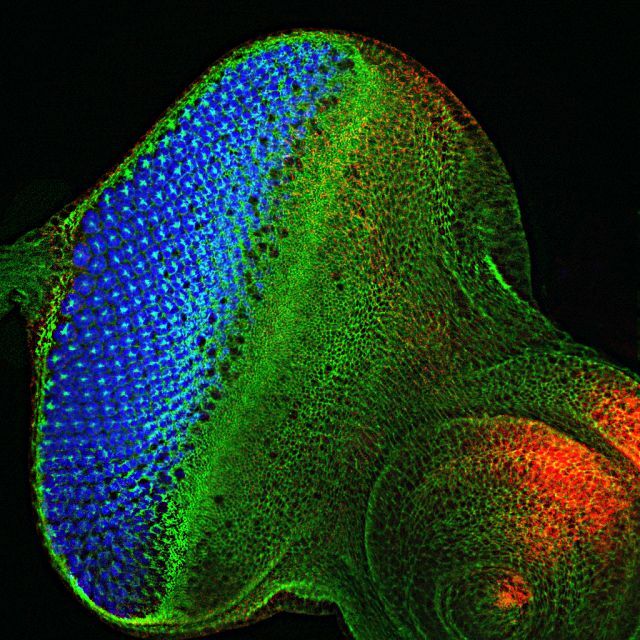 Image above is a Drosophila eye imaginal disc, taken in the TREND Center's Development and Disease Lab.